6 Tips For A Stress Free Life - Tips and tools that add value to your world. To give you balance and to make you feel good. You can use these in life, business or both. Stress. We all know that stress isn’t good for us. It can wreak havoc on our bodies by causing weight gain, insomnia, depression, anxiety and so much more. But, like a lot of things it’s part of life and everyone has some sort of stress that they have to deal with from time to time. So, what’s the best way to handle stress? I’ve found a few solutions that work for me and wanted to pass along so that you can put to use as you see fit. 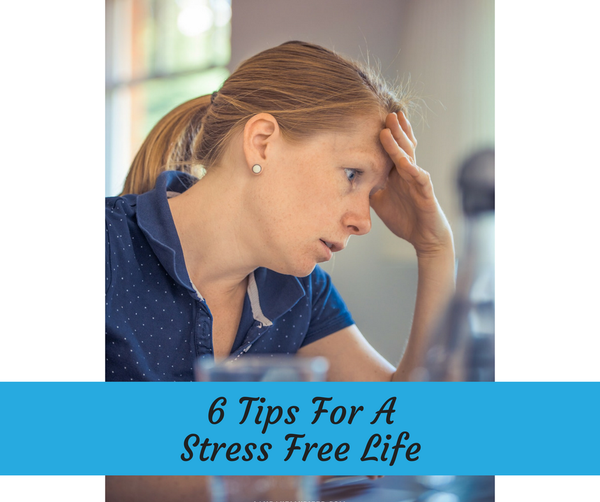 Here’s 6 Tips to Help You Create A Stress Free Life…TODAY! Just say No! Yep, you read it correctly. Saying no to others is perfectly okay. You don’t have to do everything for the sake of being liked or cared for. Regardless of what others may tell you, know that you are worthy, you are loved and you are accepted. In the beginning, it might be a little uncomfortable to say no but as time passes, you’ll find that you can become stronger and less stressed by picking and choosing projects or tasks that work for you. One thing that I’ve learned is that when my schedule is over-packed and I take on more, I end up resenting whatever I reluctantly agreed too. That can lead to all sorts of problems. Here’s the thing about saying no that can make all the difference. When you say no politely, everything will work out just fine and guess what!?! You don’t have to give any explanation. Breathe it in! I’m a BIG believer in taking deep breaths and meditating. Often, I’ll step away from the computer or after a stressful phone call and find a quiet spot. There I’ll close my eyes, and focus on my breathing for 5 minutes. It feels good and I end up feeling better. It’s so simple to do. Crank it Up! I LOVE music and there’s nothing better than turning up my favorite tunes. Even when I’m not under stress, music is a sure way to put me in a good mood. Laugh it Off! I’m sure you’ve see that quote “Laughter is the best medicine.” and I totally agree. Sometimes while running the kids too and from practice, instead of music or one of my self-development courses, I’ll turn the radio to a family comedy channel. We all crack up and end up in a better mood instead of that “rushed” feeling that we began the trip with. Get your Shut-Eye! More and more, folks are telling me that they aren’t getting enough rest. This leads to tired and cranky people. When you’re feeling overly stressed, schedule in time for shut-eye. Your body will thank you. I like to diffuse a little lavender essential oil before bedtime. Focus on your Fitness! I don’t know about you but there have been times where when stressed or overly busy that I decided that if I missed my workout that it would be okay and I’d make it up some other time. That didn’t always happen. I find that when tired, stressed, upset, whatever that my fitness can actually help clear my mind, put me in a better mood and keeps me on track. Are there days that I don’t want to do it? Absolutely! But, I really do feel better when I take the time to fit a workout in. I have used the 6 tips to help me manage stress. I know that you can too, find ways to manage yours. Do you have additional tips that you would like to share? Comment back and let me know.